Finding something in the Maps app is only half the job. The other half is getting there. 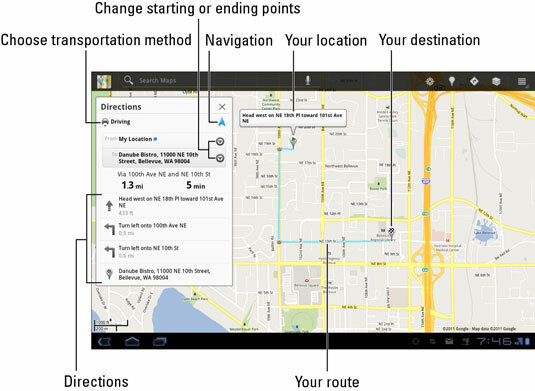 The Galaxy Tab has direction and navigation features nestled in the Maps app. The Galaxy Tab does not have a car mount, like a cell phone does. Therefore, if you use your Tab in your auto, have someone else hold it and read the directions. Or use voice navigation and, for goodness sake, don’t look at the Tab while you’re driving! 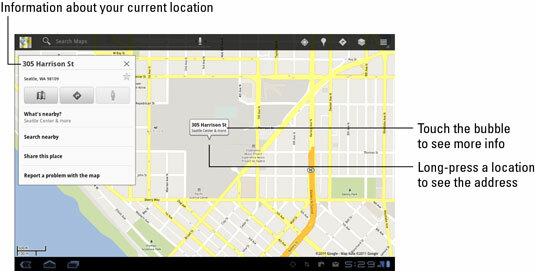 Touch a location’s cartoon bubble displayed by an address, a contact, or a business or from the result of a map search. A pop-up window appears, offering more information. A menu appears, offering three choices. Choose Get Directions from the Please Select menu. A list of directions appears on the left side of the screen. The list starts with your location and ends at the location you selected. A blue line on the map on the other side of the screen shows your route.